The Albino Leopard is a double recessive morph combo all of us have been dreaming for a long time. This combo is getting more and more common and the experience has shown that Albino Leopards are as versatile as the look of each Leopard. The Leopard pattern is causing that not less animals are looking very light and getting some sustainable color on them has become a major task of our selective line breeding projects. This is the reason why the Sunglow Leopard (Hypo Albino Leopard) is way more popular from its appearance. There are a few exceptional colorful animals existing but unfortunately this is mostly not the case. 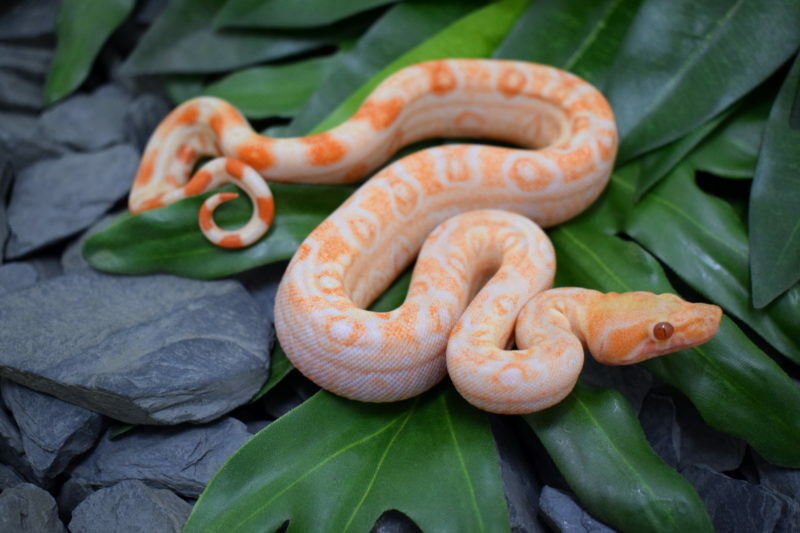 But… the Albino Leopard are key to produce many further morphs like Sunglow Leopard or if you even add the colombian Motley too, to breed Sunclipse (Sunglow Eclipse). The name Sunclipse stands for a colombian Motley Sunglow Leopard and already the hets are looking just amazing cause the Sonoran blood influence of the Leopard causes that the Motley mostly appear with a fully reverse stripe!